Evanston, Illinois. September 8th, 2018. Quarterback Daniel Jones leads the Blue Devils to one of their largest victories of the still young season finishing with 16 of 22 completions for 192 yards and three touchdowns in the 2nd quarter alone. From the stat sheet, it would appear as though it was just a normal victory for a Blue Devil squad that has become accustomed to winning. Yet, nothing was normal about this game. At the end of the 3rd quarter, Jones was sacked by a Wildcat linebacker and appeared to be injured; he was whisked off the field by the medical staff and XRay-ed on site at Northwestern Stadium. As the game went on and the fans in purple continued to roar up above, the results came back: a broken collarbone. The next day, Jones was operated on by surgeons in Duke Hospital, and it was clear that the road to recovery would be a challenging one. Besides the complications of the injury itself and the physical therapy that would need to be done in order for Jones to get back into good enough shape to start another game, the medical staff would need to ensure that Jones’ injury would not be exacerbated should he be hit again in a game. 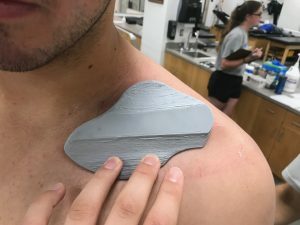 Stumped by how to protect Jones’ fragile collarbone, Duke’s executive director of athletic medicine, Hap Zarzour, approached two senior engineering students on the football team and said “boys, what can you do for me?”. Our story begins months earlier, during the spring semester of last year. Clark Bulleit, a senior Biomedical Engineering student and offensive lineman was working on an independent study in which he was designing and 3D printing a brace for his wrist. Working on this project and using the Innovation Co-Lab’s 3D printers to bring his designs to life, Bulleit felt like there was a possibility that one day, the campus maker space would be able to help out his injured teammates. Bulleit excitedly told Zarzour about the potential of 3D printing for medical applications and had him tour the space. Thus, in his time of need Zarzour, turned back to Bulleit and his friend and teammate Kevin Gehsmann, a mechanical engineering who is currently doing an 3D printing independent study under Dr. Andy Miller, to come up with a solution for how to protect Jones from further injury. The duo sprung to action, designing and creating a 3D-printed brace at the speed of light in under three weeks. 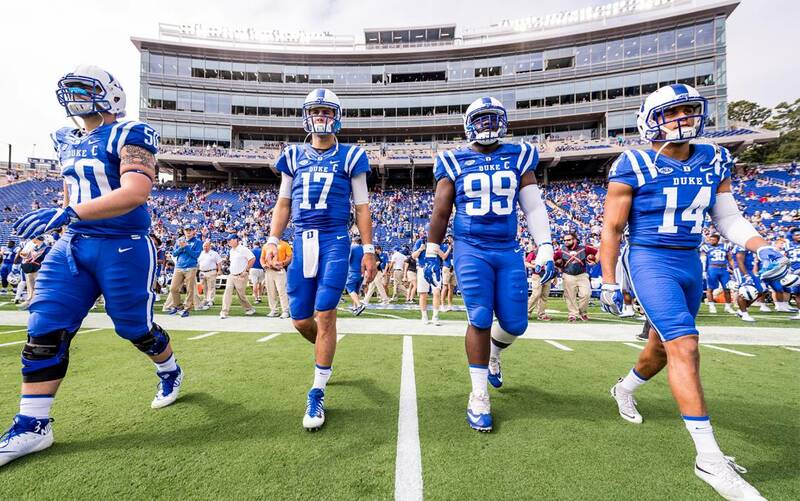 “This is definitely a first for Duke football,” Gehsmann said. The design process was incredibly complex and multi-faceted. 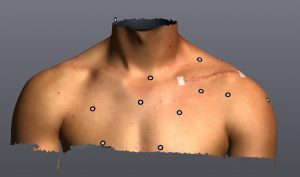 Bulleit and Gehsmann started out by borrowing a 3D scanner from the machine shop which allowed them to produce a rendering of Jones’ chest and the injured area. Then, they began the incredibly complex process of using that scan to create a 3D design for a brace that would fit perfectly to the affected area. 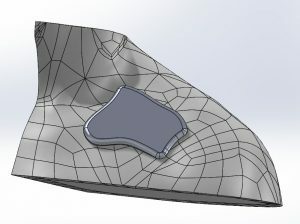 They spent hours playing with the design in Solidworks, tweaking it to be both comfortable and protective. Typically, physical trainers soak a thermoplastic in a hot bath and then mold it by hand on top of the affected area in order to create a hard shell to shield the bone underneath. This technique, though, is done in minutes and often is uncomfortable for the player and restricts their range of movement. So when iterating on their design, Bulleit and Gehsmann made sure that their brace would not only fit perfectly to Jones’ collarbone and distribute the force of impact evenly onto surrounding areas, but also be comfortable and allow for optimal performance. Overall, nine prototypes were created on with ABS plastic in the Ultimaker printer before the final deliverable was printed on the PolyJet for a more professional look and feel. What’s incredible about this project was not just the sophisticated design and innovate use case, it’s also the speed in which Bulleit and Gehsmann were able to get this done. In just two weeks and change, they went from a scan to a model through a several different prints and finally, to the brace used in the game. “When the final Polyjet print came out, [Chip] had one of his staff members come by at 2am to help clean it up so we could get it at 6 am before practice that Wednesday because Daniel had to use it in practice if he was going to use it in the game,” said Bulleit. Before the Virginia Tech game, it wasn’t certain if Jones was ready to play. However, “the decision was a no-brainer,” said Head Football Coach David Cutcliffe. “Hap fell in love with this [brace], and was telling our trainers all about these 3D printers. He so was so confident in this brace that he told us that Daniel was symptom free and felt no pain and with this device, there was no way he was going to feel any contact.” And indeed, has been back on the field with no signs of injury or slowing down anytime soon. Jones has worn Bulleit and Gehsmann’s brace in every practice and game since returning and will continue to use the device until he is fully healed. 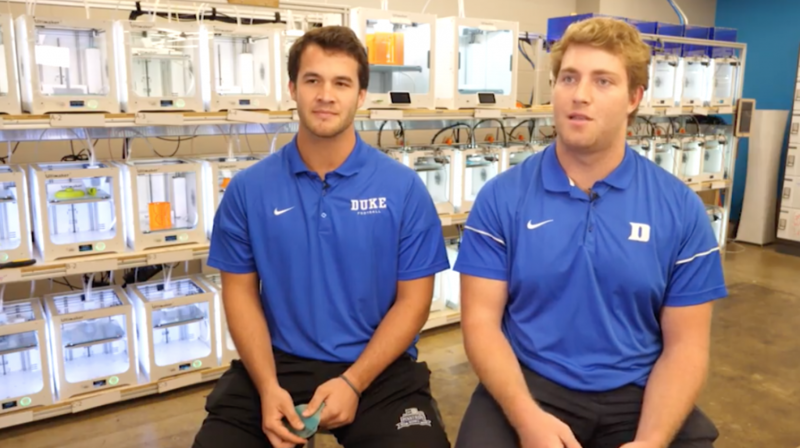 While the future of Duke football looks bright (at least for this season), Bulleit and Gehsmann will graduate in the spring and take what they have learned both on and off the field with them into their respective journeys. Bulleit plans to go to medical school and become an orthopedic surgeon, while Gehsmann said he’s still searching for engineering jobs. But who knows, maybe these two will end up starting their own venture in the digital fabrication of medical devices for athletic injuries? This entry was posted on Friday, October 19th, 2018 at 11:29 am	and is filed under News. You can follow any responses to this entry through the RSS 2.0 feed. Both comments and pings are currently closed.